When I first started this blog, I kind of hoped that I’d be adding something to the pot of “damned data.” That I might, every so often, uncover an incident that other Forteans would want to add to their files. But the following, which appeared in The Derry Journal of 27 February 1939, is just a great ghost story - and I love everything about it. 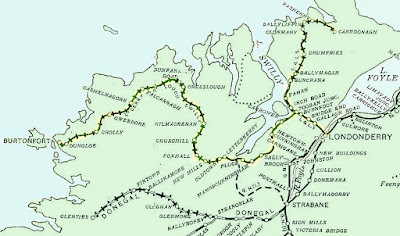 A brief reference in a Dublin paper to a ghost train stated to run between Buncrana and Dumfries on the Lough Swilly Railway has set some local sceptics scoffing, and one of them has written asking me “to tear the story to tatters.” Unfortunately, I cannot oblige, for the very good reason that the story is true. I’ve known of the ghost train for a long time and, what is more, I know some of the railway officials who have seen it. It created a sensation on its first run. The keeper of a crossing gates below Buncrana saw it one night clattering along towards him. He was amazed. He had not been notified that a special was passing, but he rushed anyhow to open the gates on which it was bearing down. The train reached the gates before him, passed through and passed on, but did not smash the gates. That made him feel creepy. He had no doubt about the train. He was beside it when it went through – steam up, fire blazing, two coaches lighted up – and he actually saw the driver leaning over the side of his engine and the fireman behind him. He spent an uneasy night. 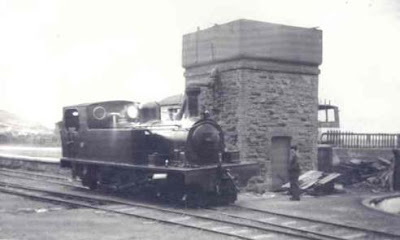 In the morning, any doubts that came with daylight were removed when other gate-keepers confirmed his story and the station-master at Dumfries had actually written to Pennyburn about the special that had passed and of which he had got no notice. The accounts of all these people tallied – the length of the train, its composition, its staff. After this the ghost train made several runs over the same section of the line and was seen by a number of people. It always passed at the same time at night, had the same two lighted coaches, and the same fireman and driver. Their faces were quite distinct to all who saw them, and it was the same men on each appearance. There is not the slightest doubt about this ghost train, from all the information I got on the subject. It has long been an accepted fact. The only inexplicable thing is that there is no reason for it. When such apparitions have been seen elsewhere there has been some cause – like a disaster – to account for it. But there is none in this case. 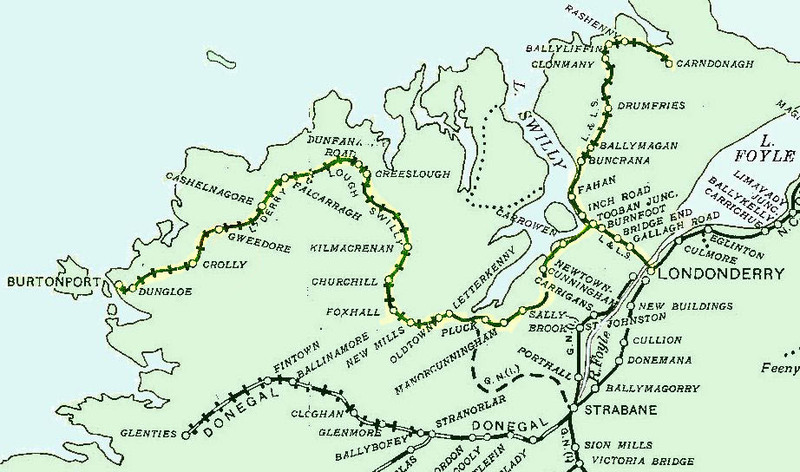 The only disasters on the Lough Swilly line were the overturning of a train by a gale on the Owencarrow Viaduct and the collision, nearly half a century ago, at the Collon. Nothing happened on this section save the accidental killing of a man, and that could form no basis for this ghost train, with its lighted coaches, and always the same driver and fireman. It looks as if it must remain a mystery. I understand that there is speculation amongst those living along the line there whether, now that the rails have been lifted – the last of them were removed a few days ago – the ghost train will still be seen doing its weird journey.